The kids really enjoy visiting Tennessee during Spring Break and almost every year, we head there and have a really fun family-friendly Tennessee vacation! *This post contains affiliate links. This post also contains sponsored content in the Pigeon Forge/Gatlinburg, Tennessee area. All content and opinions are my own. 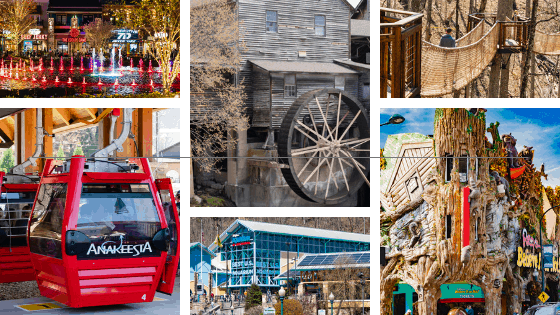 If you’ve never been to the Pigeon Forge area of Tennessee, you’re missing out on some great family-friendly fun! There are so many things to do in Pigeon Forge and the surrounding area. Whether rain or shine, you won’t be missing out on the fun because there are so many attractions to visit! Pigeon Forge is such a fun and family-friendly area to visit. There are plenty of places to stop in for fun including mini golf courses, race tracks, gifts shops, and there are some great places to eat. We stopped and shopped The Old Mill District located off of the Parkway and I fell in love with the area. Not only is The Old Mill restaurant located there but there are lots of spots to stop in for pottery, metal-crafting, homemade soaps, jewelry, and more. There’s also the Farmhouse Kitchen and The Old Mill Candy Kitchen. The Farmhouse kitchen smells amazing when you enter it and it there is a very nice variety of cooking oils to purchase, as well as homemade loaves of bread, dips, and other delicious foods. They do have samples set out so you can taste how delicious it is for yourself! I fell in love with their blueberry banana bread that once I got home I started working on a copycat! You can try my Copycat Recipe for The Old Mill Blueberry Banana Bread here. At The Old Mill Candy Kitchen you will find lots of packaged and homemade candies. They also make fudge there that in my opinion, is the best fudge in the area. If you’re ever there, try out the Tiger butter. It has a vanilla fudge base layered with creamy peanut butter and topped with a vanilla and chocolate fudge swirl. It is amazing! This interactive and engaging show is one that our family really enjoyed! There’s even a pre-show held in The Saloon featuring a bluegrass and country band. The banjo player has played with Dolly Parton, herself and is a 4-time National Banjo Champion! The show itself is very entertaining and you won’t need to worry about your small children getting too wiggly in their seats. There are lots of live animals, fun rooting for your “side”, clean comedy, and even stomping your feet to the word, “Stampede!” Dinner is also included!! You can read more about our Dolly Parton’s Stampede Dinner Show experience here. One of the first nights we visited we ate at the Local Goat restaurant. It was on our list to try a couple of years ago and we tried it out this time around. It was extremely busy with a wait and reservations are recommended. The food was really good and the service was so-s0. Our waiter was a bit pushy and wasn’t really on his game but the food was delicious! We ordered the Shrimp & Grits, Fettuccini Rocco, Chicken Tenders and Fries, Hamburger and Fries, and for dessert we ordered Chandler’s Warm Chooclate Lava Cake. One of our favorite spots to visit is the Island at Pigeon Forge. There is free parking and you can hop on the tram and get a free ride to all the fun. There are places to eat, places to play, and lots of fun to have. There’s even a 200 foot-tall Ferris wheel in the center of the Island and it’s one of tallest in the Southeast. Whether rain or shine, the Island is open for fun. There’s a really fun arcade, a rope course, bumper cars, and many other fun things to do! There’s also a sitting area that encircles the dancing fountain where you can sit down, enjoy each other’s company, listen to music, and enjoy the fountain. My family really enjoys participating in escape games. It’s fun quality time and it’s time well spent together! In these interactive, puzzle-solving games, you race the clock to escape in 60 minutes. Everyone works together to get out in time and it’s a great communication skill builder! Read more about our experience at the Escape Game Pigeon Forge here. We ate at the Timberwood Grill on the Island and absolutely loved it. Everyone was so courteous and kind. The service was absolutely amazing and the food was so good! They have lunch, dinner, and kids menus to choose from. Timberwood Grill serves complimentary cornbread muffins that we absolutely fell in love with. It’s another recipe that I came home and made a copycat for! You can get my Timberwood Grill Copycat for Sweet Cornbread Muffins here. We ordered Smoky’s Fancy Chicken, Twin Forks Kickin’ Chicken, Kid’s Skillet Steak, and the Kid’s Chicken Tenders. We all enjoyed our food! Gatlinburg is a place that you can easily spend the whole day at. There are so many shops to visit along your walk through Gatlinburg. There are also quite a few restaurants as well as fun attractions to stop and play. One of the first places see you see upon entering Gatlinburg is the Ripley’s Aquarium of the Smokies – it’s rated the #1 Aquarium by TripAdvisor! It certainly is a lot of fun and you can easily spend hours there! There are lots of other Ripley’s Attractions in the area, they include The Ripley’s Believe It or Not! Odditorium, Haunted Adventure, Mirror Maze, Moving Theater, Davy Crockett Mini Golf, and The Guinness World Records. You can get discounts of combo passes by heading to the Ripley’s Gatlinburg website. The Ripley’s Believe It or Not! Odditorium was recently renovated and we couldn’t wait to check it out! There are so many fun, freaky, and interesting things to learn about inside the Odditorium and the kids really loved it! The Mirror Maze was a lot of fun for the kids. We’ve done this maze before so we let the kids lead the way this time and it took a longer than it did last time to go through it. They had a lot of fun finding their way out and leading the way. Upon entering Gatlinburg, Ripley’s Davy Crockett Mini Golf is located before you get to the busy part of Gatlinburg. They have private (and free!) parking which is really convenient. This mini golf course has lots of stairs but it has handicap accessible routes. This was another fun activity for the kids because the golf greens were all unique which made it a fun game. This museum is incredibly fun! It’s interactive and fun for the whole family! You can even attempt to break world records!! They give everyone a card upon entering that so that you can keep track of your scores, it also updates the scoreboard for each game that you play if you place high enough. You can easily spend 2 hours here – there is so much to do! This is an absolutely fun and beautiful aquarium. It’s well maintained, has lots of species of fish and other sea animals and it even has a Penguin Playhouse! This is another place that you can easily spend hours at. There’s a multilevel play area for children and there’s also a food court. My family loves visiting this aquarium and they never tire of it. If you visit Anakeeta, plan for a day there. It has a tree canopy walk, a children’s treehouse, ziplines, and coasters! There are also places to eat, and places to sit down and relax. You get to the top of Anakeeta one of two ways. The first is on a chair lift that fits 4 people or you can choose to ride in the Chondola, which is fully enclosed and seats 6. It takes a bit to get on the lifts and to get back down again, so make sure you leave plenty of time if you made plans after your visit. View from the top of Anakeesta. The Tree Canopy walk doesn’t allow strollers so you’ll need to park it at the Kids Treehouse and walk back to get it. There are lots of things to check out if you wander off the Parkway, like mom and pop diners, movie theaters, shopping strip malls, and other local areas to shop. If you’re in the mood for a movie or it’s simply a lazy rainy day, the Governer’s Crossing Stadium Cinemas in Sevierville is a fun place to watch a movie. The movie theater is reasonably priced which is perfect for families. They have XTREME theater seating for some movies which has reclining seats and 55 food wide screens. The food here tastes authentic and amazing. The waitstaff is friendly but the attitude and friendliness of the owner is lacking. The restaurant isn’t located on the Parkway and you have to travel into Sevierville to get there. The food is worth it! The food is so delicious! You can watch the food you ordered in the kitchen be prepared through the large passthrough which is really neat. Overall, it was a great place to eat, we would definitely eat there again despite our interactions with the owner. Our vacation to Tennessee was so much fun this year! There are so many fun things to do and see in the Pigeon Forge area and it’s very kid-friendly! If you’re looking for a place that you can slow down and enjoy family time, plan a vacation to Tennessee!